The Desert. Ninth Stretch: Green Valley Fire Station to Manzana Wind Farm. Day 29: Green Valley Fire Station to Maxwell Guzzler. 15 miles. I woke up early to get out of the fire station gazebo before any of the crew showed up. The blisters on my heels had refilled themselves overnight and loudly reminded me they weren’t fans of walking today. A water faucet at the station allowed for some quick laundry. Invigorated by the fresh smell of my disgusting feet all over my hands, I loaded up on water for a long, dry, uphill stretch ahead of me. Despite my blisters, I felt good and made quick time in the cool of the morning. I caught up to the solo German hiker, Walkabout, soon after starting. We had been leapfrogging the day before, pausing occasionally to commiserate about sharing the trail with the runners. A couple more miles down the trail, I saw another familiar face. Yukon Jack was standing on the side of the trail. As I approached, Yukon Jack called out something to me I didn’t understand, so I just smiled and quickly strolled towards him. I got within 20 feet before I realized his wife, Yukon Jane, was crouched right behind him off the trail, peeing. I pumped the brakes and turned around, a bit embarrassed. Everyone brushed it off though and we stood around for a long rest and talked about the strategy for the upcoming Sierra. We continued on and held a good discussion for a while, but soon we were separated again. Walking through the regrowth from the Powerhouse Fire. After a dry, desolate walk through the scar of the Powerhouse Fire, I came up on the next reliable water source: the Maxwell Guzzler. Guzzlers are tank systems that collect rain and snow water for wildlife use during dry periods. They’re an essential source of water through some sections of the PCT, but the water is rarely pleasant. The Maxwell Guzzler was no exception. Yukon Jack collecting some yummy guzzler water. Yukon Jack, Jane, and Walkabout all caught up and we used our titanium mugs to lean in and scoop the green, buggy water out of the reservoir. I thanked the trail gods for water filters, then sat down on a nearby log for lunch. Filters: the best invention in the history of inventions. The previous summer, I’d completed my first 30+ mile day on a linkup of the Sierra High Route, John Muir Trail, and McGee Pass Trail. When I set off for the PCT, I knew the flatter desert portions would allow for an attempt to hike 40+ miles in a single day. Where I sat on that log, I was 23 miles from the flat stretch of the Mojave Desert, which was followed by an 18 mile walk along the Los Angeles aqueduct. That would set me up pretty ideally for a 41 mile day if I felt good enough to walk that far in one stretch. I could feel the stabbing pain in my left heel coupled with the raw blisters on both feet collectively crying, ‘Nooooo! !’ Even in my mind, I told myself I needed to take it easy on my already-battered feet. But my common sense is no match for my stubborn goals. I was only 15 miles in, so I told myself it had been a light day on my injured feet and I’d allow myself plenty of rest by staying off my feet for the rest of the day and getting to bed super early. I set up my tent in the warm afternoon among the large pinecones littered across the ground and boiled some water for another incredible meal Melanie had prepared for me. Camp at the Maxwell Guzzler. This time it was a red wine sauce with peppers and mushrooms over angel hair pasta. I inhaled my food before I could even register what was happening, spent a respectful minute mourning the loss of my dinner, put fresh bandages on my feet, and got into bed before the sun was down. Bandaging up all the blisters for the next day. Day 30: Maxwell Guzzler to Manzana Wind Farm. 41 miles. My deep sleep wouldn't last for long. Wind kept my nerves on edge throughout the night. Massive gusts would surge through the area, violently jostling the tent. Every few gusts, I’d hear a loud ‘thud’. After staying awake trying to brainstorm the scariest monster that could possibly be making the noise, I finally connected that it was the huge pinecones that were everywhere actively falling to the ground! Each gust brought more sporadic ‘thud’s, keeping me awake and leaving plenty of time to wonder what the odds of dying from a 10 pound pine cone were. I slid my backpack over my head for some protection and slid back into a shallow sleep. I was grateful when my alarm went off at 3:30. I packed up in the dark, windy night, flinching every time another giant pinecone hit the ground. I knew it was pinecones… but monsters could make that noise too, ya know? Telling my cowardly mind to stop freaking me out, I headed out on the trail by 4 a.m. I traveled in the small, dim bubble of my headlamp. I knew I needed to swap out the batteries in my headlamp, but I wasn’t about to stop and waste my head start on the day with swapping out batteries! It definitely didn’t have anything to do with the monsters chasing me. Dawn along the trail. No more monsters for this guy. The black night turned into the soft blue light of dawn. The light increased until I could turn off my useless headlamp. 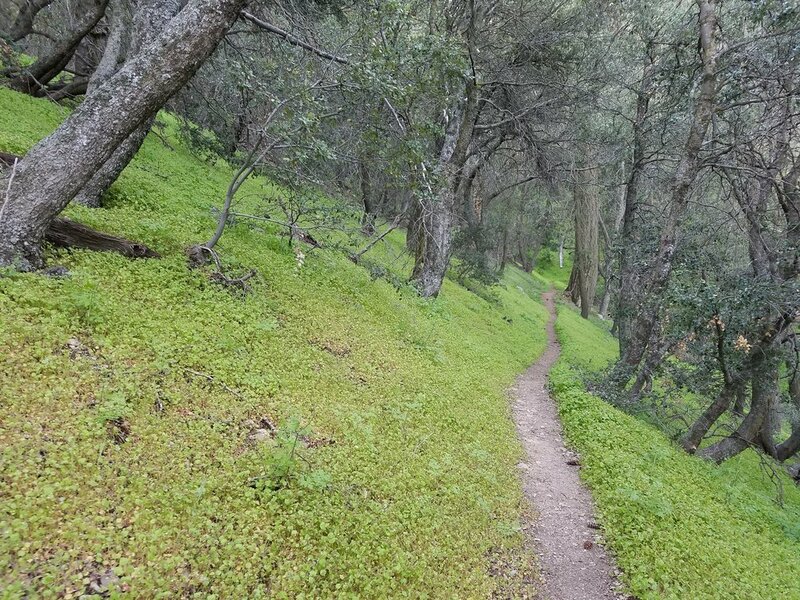 My mind stopped torturing me with worst case scenarios and started enjoying the full, green fields of miner’s lettuce I was hiking through. Beautiful fields of edible miner's lettuce. I passed the 500 mile marker soon after starting. The sun wasn’t quite up and I’d already hiked eight miles. I passed Walkabout and Yukon Jack and Jane, just emerging from their tents for the day. The early miles were small ups and downs leading to a big, steady downhill towards Hikertown. At this point, I wasn’t sure whether I’d shoot for the 40+ mile day. My blisters were talking to me, I hadn’t slept well, and Hikertown was 23 miles from where I’d slept, so it would be a reasonable place to stop for the night. I hiked out of the trees and views of the expansive Mojave desert opened up in front of me. I knew I’d have to cross the expanse and tried not to think about it too much. 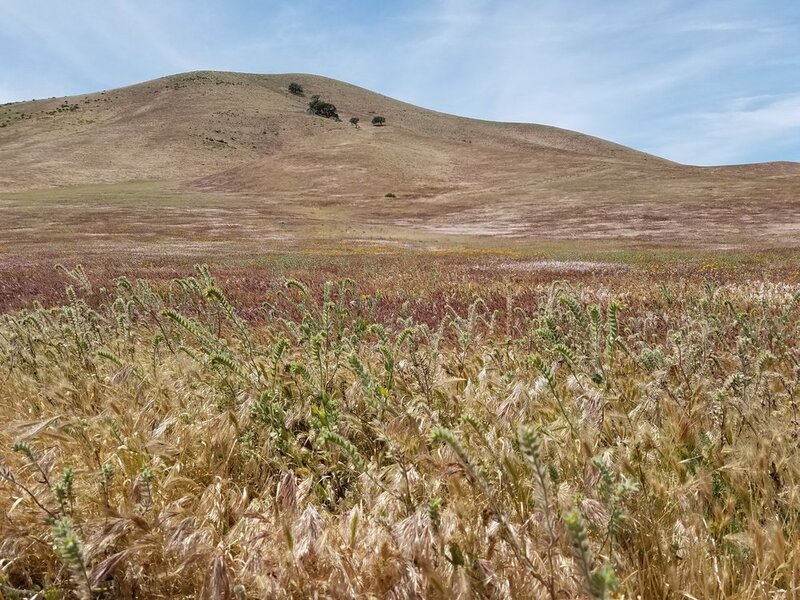 I descended into the dry, grassy desert hills when I came across two packs on the trail and noticed a hiker couple high up on the hill above the packs. Grassy desert hills near Hikertown. ‘Hello!’ I called out. I assumed they were PCT hikers and asked if they’d be at Hikertown that night. I quickly said goodbye and ran down the trail, away from that awkward encounter. I wouldn’t see the couple again. They quit the trail that day. The eerie sign welcoming you to Hikertown. I hit the flat, windy desert floor and was soon at the gates of the infamous Hikertown. Peeling paint and decaying mannequins greeted me as I closed the heavy, creaking gate behind me. There were small buildings lining the property, each painted and designed in classic old west themes. Nothing moved on the property except for the wind howling through the old structures. The creepy factor was through the roof and the idea of staying for the night was immediately removed from the schedule. I filled my water bottles from a faucet near the entrance when I noticed there was a backpack on a table in the middle of the compound. I walked over and another hiker I’d met previously, Nicolas, appeared from around the side of a building. It felt good to see another hiker. We talked for a minute, commenting on the creepy, deserted feel of the place. Nicolas said he’d seen some movement in the back of the compound an hour earlier, but nothing since then. I wandered around, looking for a bathroom when I saw an older man walking toward me. He introduced himself as Bob, the owner of Hikertown. A very friendly fellow, he gave me a quick tour and made a strong suggestion that donations were required for hikers to stay. I’m not sure that’s how donations work, Bob. I still didn’t have my wallet that I’d forgotten with Melanie several days before, so that sealed the deal; I’d be walking past Hikertown to camp for the night. It was only 1:30 and I’d already hiked 23 miles. I did the math and figured the long, flat stretch ahead of me would be easy ground to cover if I wanted to shoot for over 40 miles that day. I thanked Bob for the water and apologized for not having anything to donate. He offered to cook up some hamburgers he was selling for five dollars… I’m not sure he understood the rigid consequences of not having a wallet. The initial, open-air portion of the LA aqueduct. I headed out of the gate and connected with the Los Angeles aqueduct. An open-air section led to a long walk along the top of a giant, rusted pipe. I balanced my way along this odd section of “trail”, trying not to be blown off by the gusty winds. The aqueduct snaked its way through some houses, most of which had an angry dog to intimidate passing hikers along their length of fence. I kept walking, praying the homeowners had maintained their fences well enough. A long walk along the huge, rusted pipe. Definitely one of the most unique stretches of the PCT. Eventually, I hit the closed aqueduct, which I wasn’t aware was a thing. The aqueduct just appeared to be a concrete road, but the ‘road’ was the roof of the aqueduct. Up until this point, I wasn’t sure why water was such an issue in this section. We were going to be walking alongside an aqueduct, right? Sounds like water couldn’t be too much of an issue… But every drop was inaccessible to hikers. Luckily, I had carried extra water. I put my trekking poles away and strolled along the gentle, barely-noticeable uphill concrete slab. I turned on some podcasts to occupy my mind through the monotonous concrete slab lined with Joshua trees. The aqueduct. It's not just a concrete road, I promise. Mile after mile on the hard concrete was taking its toll on my feet. The minimalist running shoes were demonstrating just how poor of a choice they were. It seemed every pad of my foot was burning with intense muscle fatigue. I started doubting my ability to push through to my 40 mile goal. My aching feet were worrying me. Was traveling this far on such a hard surface a good idea? ‘OF COURSE NOT!’ my mind shouted at me, but I just ignored that guy. Trying to get my mind off my feet, I called my wife and talked to her for a while. It was a bit too windy to maintain a comfortable conversation on the phone, so after the 50th “what? ?” I figured I should just get off the phone. But as soon as I wasn’t on the phone, the only thing to listen to was my screaming feet, so I gave my buddy Miguel a call. We would be going into the early season, high snow Sierra together soon, so we strategized about gear, food, and resupply through the distraction of the high winds. Not paying attention, I missed a sign where the PCT leaves the aqueduct for a stretch and didn’t realize it until about a half-mile later. If my feet could talk, I’m sure they wouldn’t have nice things to say about me. I bitterly made my way back to the PCT and continued along as the sun set. The wind had brought along massive, beautiful clouds that were lighting up pink and orange in the desert sunset. The visual distraction was welcome as I pushed my mileage into the high 30’s for the day. A much needed pain distraction. Darkness came and I threw on my headlamp to push out the last mile. Rain starting spitting from the sky sporadically, carried by the intense gusts of wind. I put on my rain jacket, suddenly very aware of how uncomfortable my life would be soon if I didn’t get my tent set up before rain started. 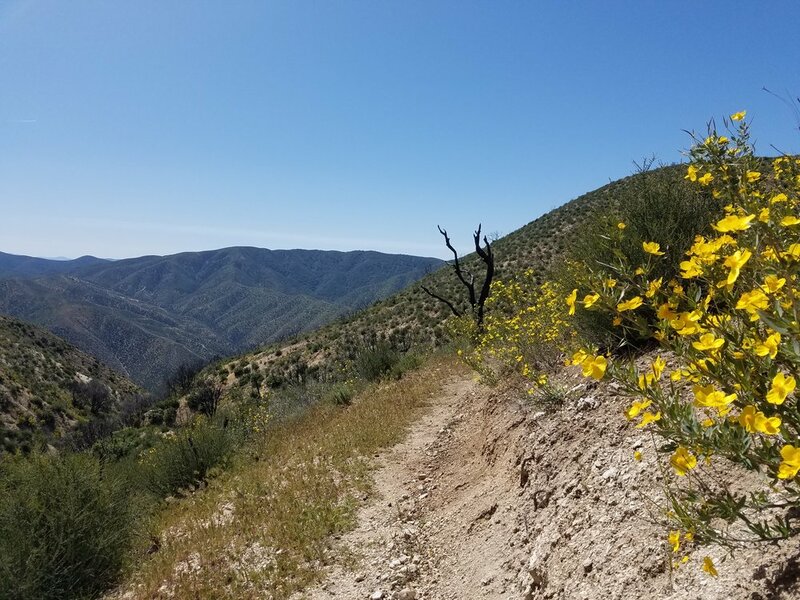 I passed 40 miles and started looking desperately for a campsite, but the dirt road I was following steepened, erasing the possibility of finding a suitable campsite. I followed the dirt road for another mile when I realized I was about to reach the first giant windmills of the Manzana wind farm. Not a good place for a wind-free night. I noticed a small, flat patch of dirt off the side of the road and slid down the steep, loose hill. It was too small for my tent, and the dirt was too soft for stakes to hold well, but I was desperate. My exhausted legs refused to work quickly as I scampered around, trying to set up my tent through powerful gusts and sheets of sideways rain. Tent stakes weren’t holding and there weren’t any rocks around big enough to anchor the tent. I threw my backpack onto my collapsed tent to hold it down and scrambled back up the loose hillside to find some bigger rocks, much to the dismay of my battered feet. The best I could find were some big clumps of hard dirt I carefully carried back down to my tent, my legs shaking from the effort of controlling the downhill movement. I threw my tent up, slung the clumps of dirt I only half-believed in, pitched the fabric as tight as I could, and crawled inside my compressed tent. Settling in for the loud night, my nerves were on edge with every gust that threatened to rip my tent from the side of that hill. I had done it though. 41 miles. Jesus. I was aware that there would be consequences though. I was aware of how much pain my feet were in. I was aware of how sore my body was. I was aware I’d overdone it. But I was proud of myself. My goals for the southern portion of the PCT were to hike the trail as interrupted as possible and to attempt a 40 mile day. I’d completed both up to this point, so I celebrated by myself in my collapsing tent with a sip of Disarrono and a smile. ‘But what about your feet? ?’ my subconscious nagged me. “Not now, you party pooper” I audibly replied as I closed my eyes and rapidly slipped into a deep sleep amidst the chaos going on around me.